This comprehensive discipleship tool kit enables churches to assess the Christian beliefs, practices, and virtues of each member to help everyone grow. The training kit is based on the Thirty Core Competencies as outlined in the book The Connecting Church, also by Pastor Randy Frazee. These thirty core competencies help churches know when they are making progress in guiding their members toward Christ-likeness. Each of the four sessions contains components such as video, lecture, leader-led discussion, large group discussion, and small group discussion. Individuals answer 120 questions about their Christian beliefs, practices, and virtues. Three friends also assess them in the virtues area. Using the results, individuals identify areas in which they would like to grow during the upcoming year. The resource guide provides plans to help realize the growth such as reading books, memorizing Scripture, attending a seminar, being mentored by a spiritual director, or engaging in a new spiritual discipline. The Christian Life Profile journey is experienced in a small group community that seeks to encourage, pray, and hold each other accountable for progress. The goal is to take the profile again, one year later, to monitor the journey. The complete kit includes a four-session Training Guide, a copy of The Christian Life Profile Assessment Tool, and a DVD to assist in training. 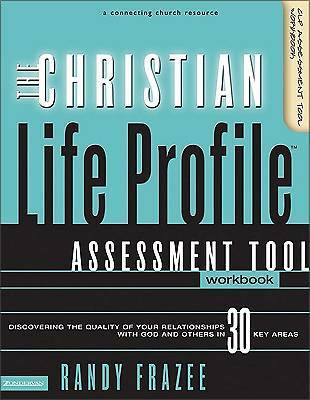 The Christian Life Profile Assessment Tool and Training Guide are also available separately."